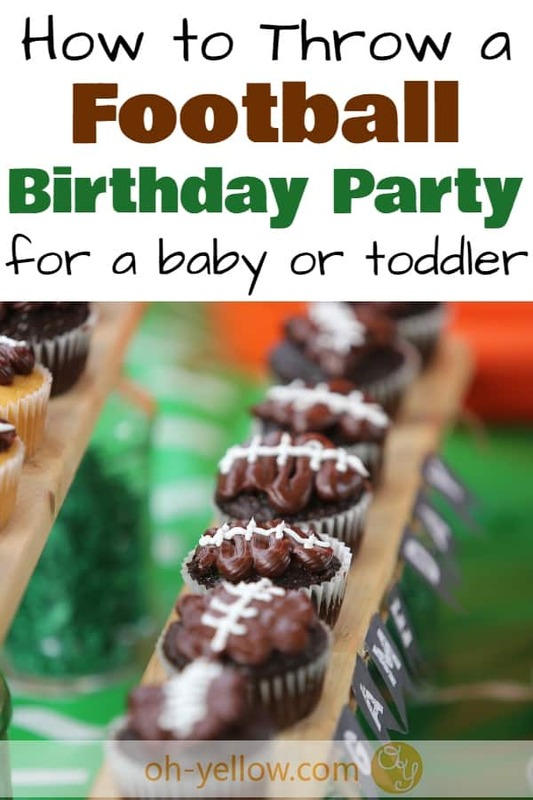 Throw a football birthday party that all of your guests will love! 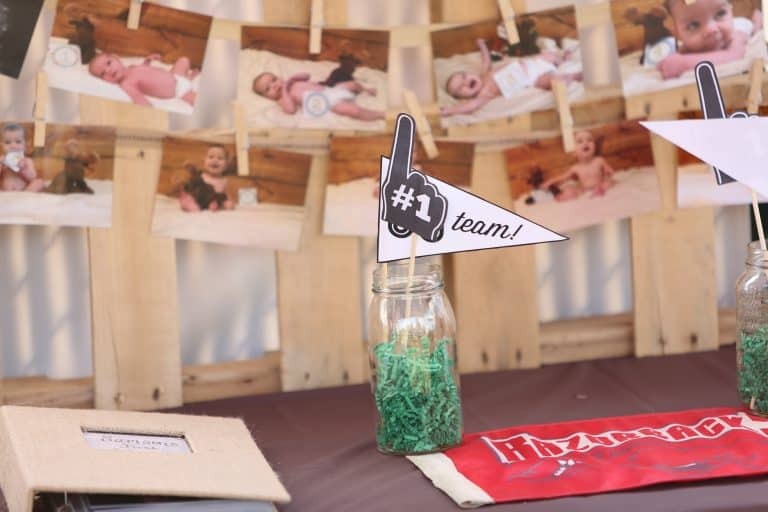 Whether you are celebrating your baby’s first birthday or partying in your toddler’s favorite sports theme, these ideas are super cute, cheap, easy, and fun! First off, Happy Birthday to your little one! But nevertheless, we party on. We can’t stop the growing, but we can sure enjoy it as we make our little one feel extra special on their big day! A baby’s birthday party is such a great time to remind them how happy we are that they are in our life. Choosing your baby’s first birthday party theme (or any age birthday party, really) can be tough. And when they are too young to give much input, it can be hard to decide exactly what party theme to go with. There are COUNTLESS first birthday party ideas for boy babies, so you could literally spend days just picking the theme! When I searched “first birthday party themes for boys” I found everything from trucks to mud to every Disney character under the sun. Try to narrow it down. 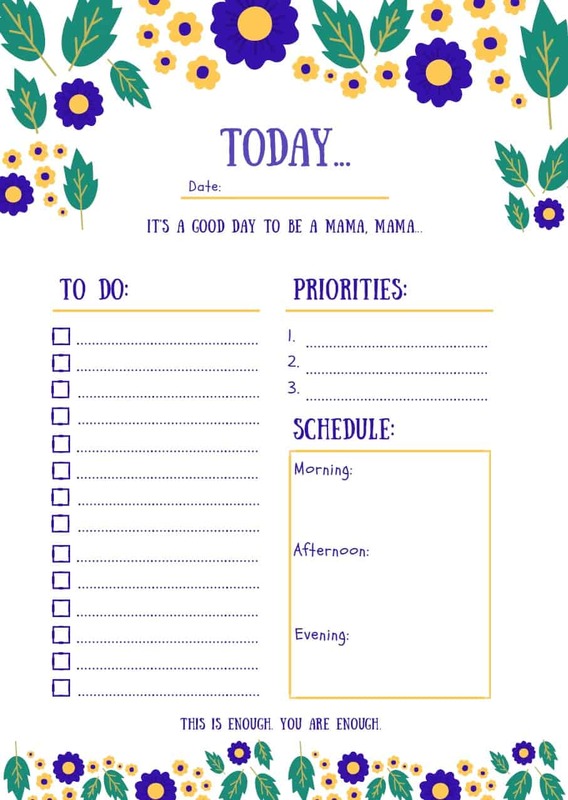 Pick something that is special to you, your family or specifically your baby. Don’t feel like you have to do a “boy themed” first birthday party. Go with what your little guy loves. My boy’s birthday party was in September, just when football season was kicking off. He loved playing with balls, so I started planning out a sports party theme, then I thought the tailgate party theme idea would be perfect. And it was! 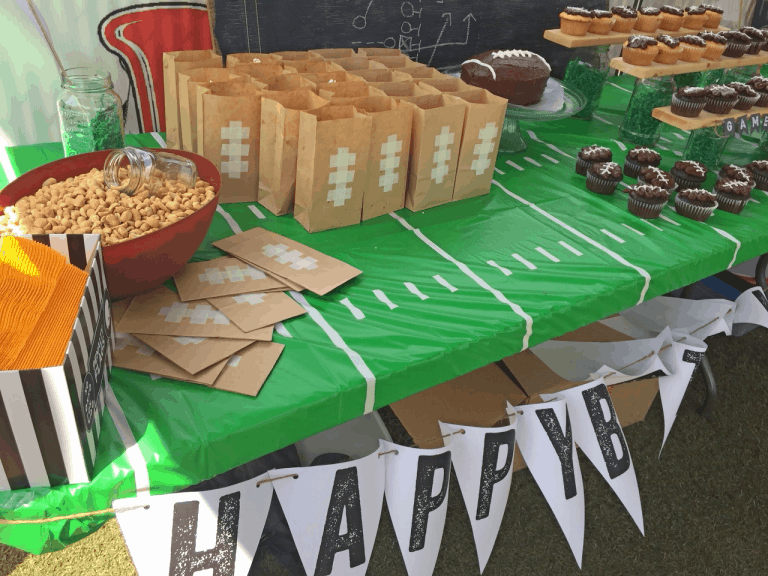 A football party theme can also be perfect in summer or in fall when there are a lot of football party decorations accessible. And it doesn’t just have to be for boys! A girl’s football party theme would be adorable and the tips below will work great for any football-loving kiddo and their family of fans. 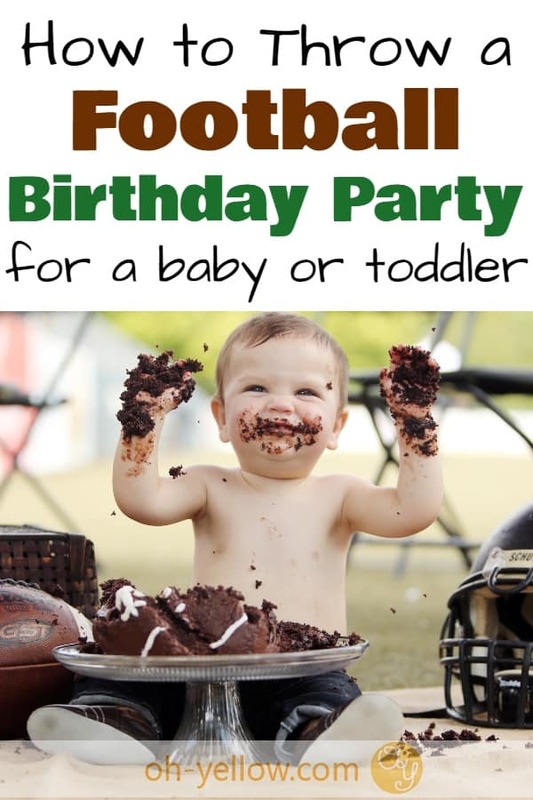 These football birthday party ideas come from my first boy’s first birthday party. It was really a blast and I had a lot of fun planning it. Below you’ll find great ideas for a football birthday party theme. From invitations, decorations, and party supplies to party food and games, this guide will help get you started. Ok, let’s get down to it! Hut hut! This post may contain affiliate links. See my disclosure for details. I’ve seen a lot of adorable handmade football party invitations on Pinterest, but let’s be honest…if you’re chasing a 1-year-old or toddler, there’s very little time left over for extra craftiness. 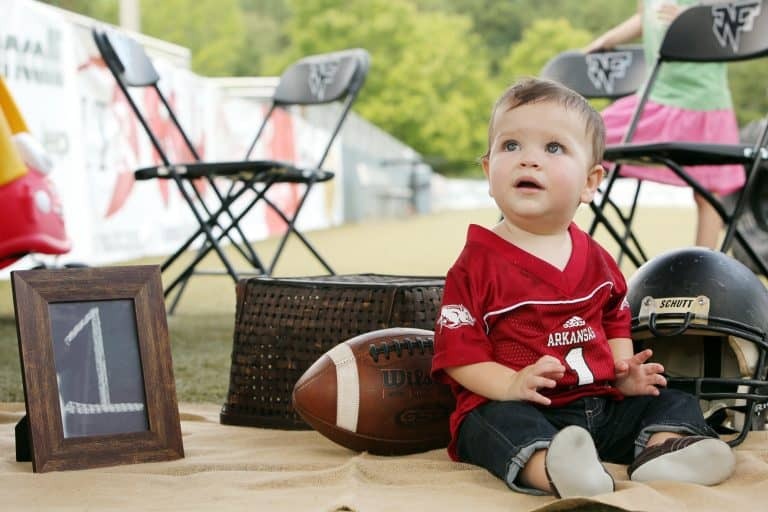 Instead, take a cute photo of your little one with a football and create a Photo Card. I just happened to have a professional picture, but candid would totally work and be so cute. You can easily add text and get cheap 4×6 or custom-sized prints using Walmart Photo or Shutterfly.com. 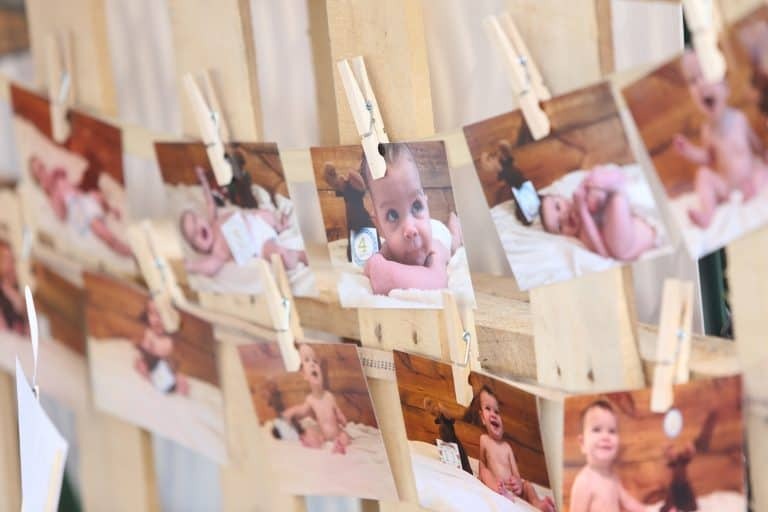 I found this to be a really inexpensive invitation option AND you get an adorable keepsake with your babe’s picture. 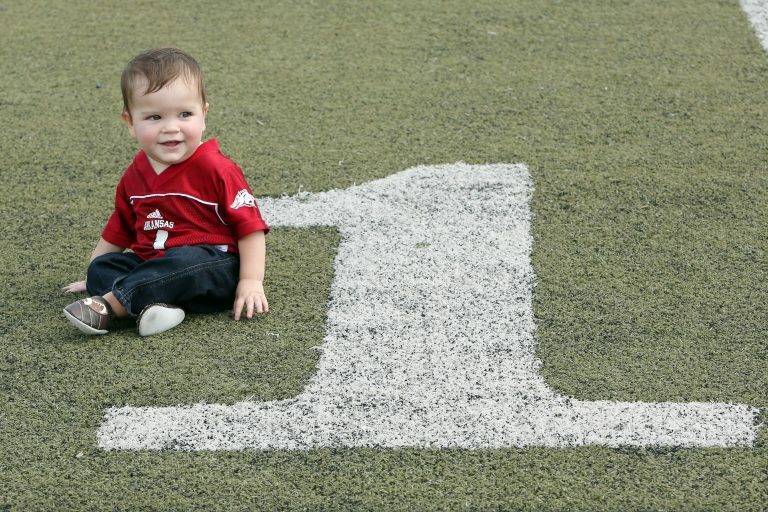 We were able to throw our boy’s first birthday party AT an actual football field, which was so cute. Think through your invite list and brainstorm if you know anyone with connections to a local school football team. Make sure you find a time when the team isn’t going to be practicing or using the field. If using a football field isn’t an option, having the party at a local park or somewhere with green grass to act as the “field” would be great. I really recommend trying to host the party outdoors so that everyone has room to run around and even toss a football. Something about throwing a sports party makes people want to be active! Oh, and have a back up plan in case of rain, of course. Ok, this part is so fun. 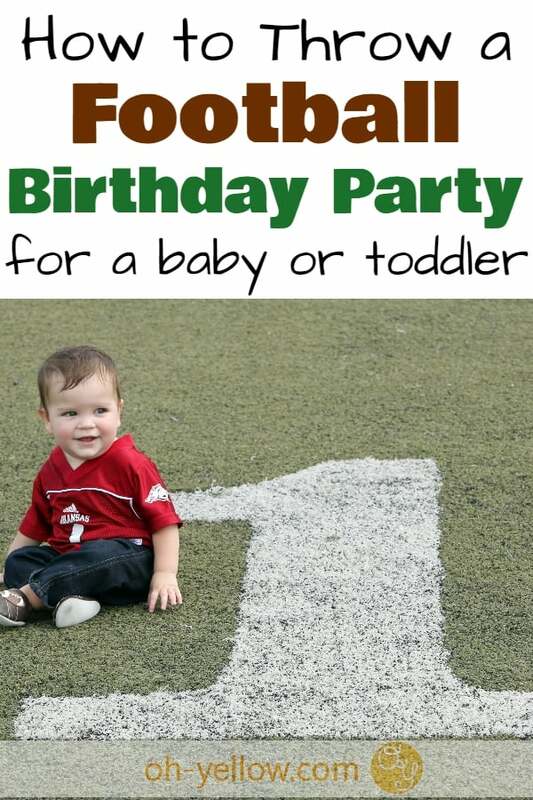 For the football birthday party decorations, you have so many great, inexpensive options. We decided to use our home state’s team as part of the football theme (even though we weren’t actually IN that state for the party) but you could definitely go with a neutral football theme. Since we were on the football field, we set up on the sidelines with two canopy tents for shade and lined up some long tables along the back. We used brown and white balloons to decorate the corners of the tent. These cute tablecloths were totally worth the extra few dollars. We had to tape them down because it was windy, but they would look really cute hanging down the sides. On the first table, I set up a long pallet board on its side and used twine and clothespins to hang pictures of the birthday boy. Since it was my boy’s first birthday party, I used his monthly progression photos that we had been taking all year. It was so fun to see them side by side and it made a great decoration and conversation piece. I wanted to do a little non football party decorating as well, so I also laid out a photo album that I had filled with photos from “Baby’s First Year.” We included all of our favorite pictures from my due date until just before the party for guests to look through while standing around at the party. At the other end of the table, I left space for gifts. Then, I laid out some free printable football themed coloring pages and word searches that I found on Pinterest for the kids at the party. Don’t forget crayons! I used helmets, jerseys, flags, footballs (also a great birthday gift option) etc. to decorate any empty spaces on the tables. 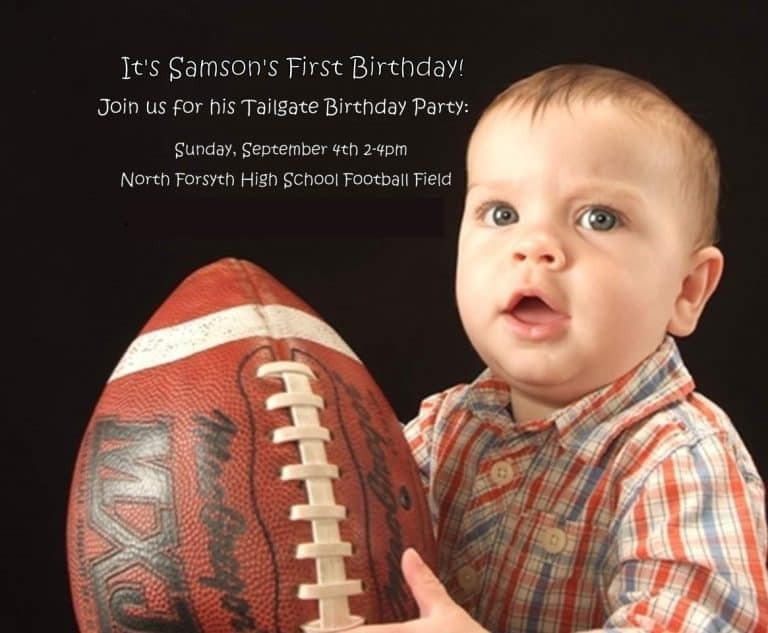 Pretty much anything I could get my hands on for free that would work for a football themed first birthday party. We used what we had at home, including anything with the team logo on it, then we borrowed a couple items from the school where the party was held. Below, I’ll tell you a bit more about decorations we used with the food and drink tables. This was one of my favorite little touches! We ordered an adorable football jersey for the birthday boy to wear during the party. It was SO cute. Choose a jersey or onesie with your child’s age as the “number.” There are a lot of great options like these cute baby and toddler jerseys on Amazon. We got one with a team logo, but there are some really cute plain football jerseys as well. This is one of the few things I did slightly splurge on. 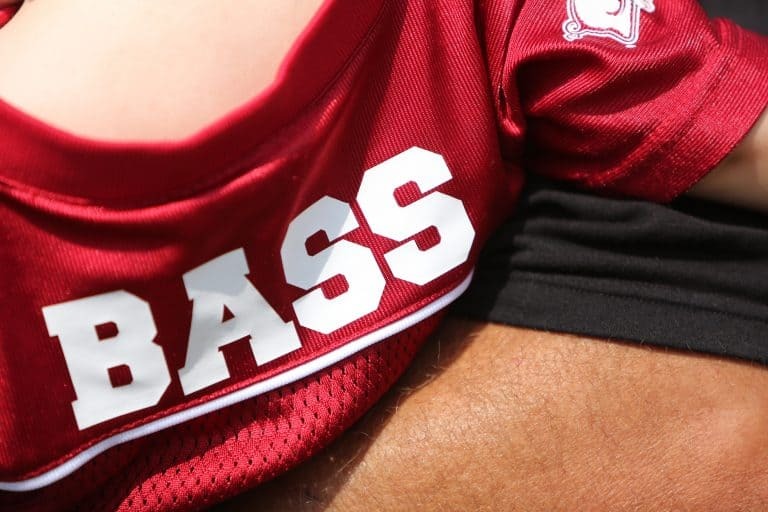 We were able to get his name printed on the back beforehand and he got to wear it throughout football season while he was in that size. It ended up being such a precious keepsake for us. It is still hanging up on the wall in his room! For the drink table, we used those big Gatorade coolers that football teams use. We filled one with water, one with lemonade, and labeled them with little football cutouts. In between we put a sign that said “Hydration Station.” Cute, right? Using ideas from across Pinterest and interweaving some of my own touches, we had a pretty cute spread. I didn’t want to do a full meal, so I just did light snacks since it was mid-afternoon anyway. We went with a “Concession Stand” theme and served popcorn, pretzels, and peanuts. I found a fun football bowl I liked and filled it with the peanuts and a small mason jar for scooping (I would have done in-shell peanuts, but I didn’t want guests throwing the shells on the field.) I bought some cute little bags to fill with peanuts or popcorn and just used masking tape to make the cute football design. It was great for guests to be able to grab a snack and walk around with it instead of hovering over the snack table. We used a homemade rustic chalkboard to write out an actual play and placed it behind the food. 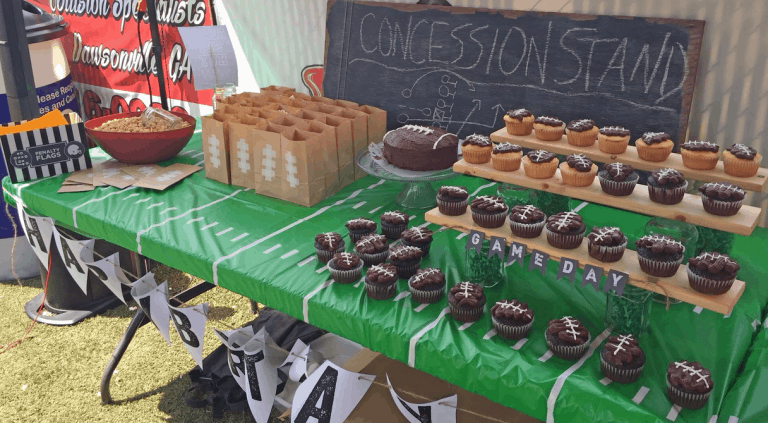 I displayed the football smash cake on a cake stand, then put both vanilla and chocolate cupcakes (which we made ourselves using boxed cake mix and frosting squeezed out of a ziplock bag) on tiered boards. We stacked the boards on mason jars and filled them with green “grass”. I put a few other jars out with the grass and homemade pennant flags for decoration too. It was a really cute, inexpensive touch! You can find these awesome football themed printable decorations from The Crafted Sparrow here and Clean Living Clean Eating here. All of the decor came together really easily and ended up being a perfect set up for our baby’s football first birthday party! Babies can’t hang very long, so our party only last about 3 hours. There wasn’t a ton of time for games, but I wanted to have plenty for guests to do while socializing. You know how it can be when you’re at a party and you don’t really know the people you’re chit chatting with. Music is a safe bet to fill any awkward silences. We just played Pandora in the background over a speaker. Just loud enough to hear without interrupting conversation. Make sure a choose a station that’s kid-friendly, but won’t drive your adult guests nuts. We set out some folding chairs and everyone enjoyed watching the little ones run around. We PLANNED to roll out a tv and have a football game on as well, but one of our cords was missing. If you can pull this off, I think it’s a nice touch, especially for the adults who aren’t into the more cutesy aspects of a baby or toddler birthday party. We set up Corn Hole (Bag-o) on the field, which ended up being really fun, and we had plenty of footballs and other balls for the kids to play around with. We also let the kids play with some of the gifts my son received that day. If you have a lot of kids at the party, you may want to let the guest of honor open them early on. That way all the little friends can explore the new goodies together. Beware of sharing drama though! And be sure to bring batteries, a tiny screwdriver and scissors to open and assemble things. Some wise gift-givers even assemble the toys BEFORE wrapping them. Thank you! Speaking of gifts, we let our boy open up his presents right there on the field. Make sure you have some shade and that everyone can see as the birthday boy or girl opens the gifts. If you’re planning a football themed 1st Birthday Party, you may want to do a smash cake! This was SO cute and really fun. My boy was allergic to dairy as a baby, so I baked him a small, separate dairy-free cake instead of using one of the cupcakes that we served guests. I ended up liking this better, because he realllly dug in and had such a blast smashing. Be prepared: Take off any special birthday clothes beforehand and make sure there is a sink nearby. Bring a change of clothes that will still look cute in pictures after the smash cake part is over. 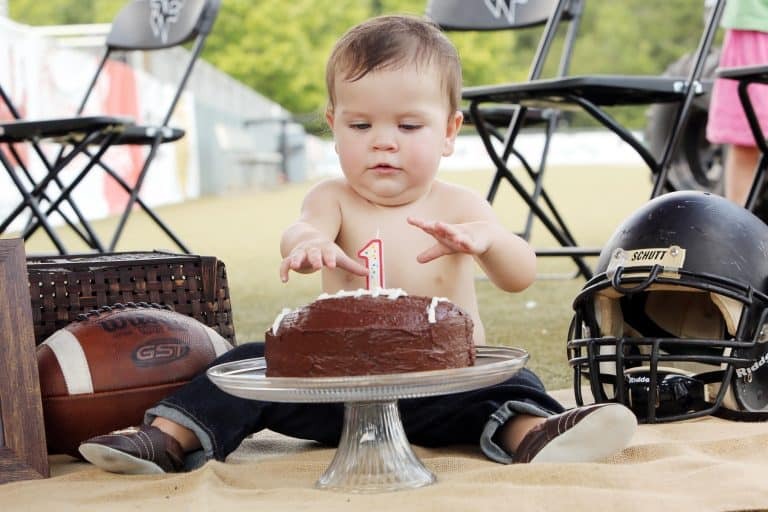 Also, if you’re using a football field, you may want to lay something down under the cake and baby so that crumbs and frosting don’t end up smashed into the field. You might get an angry call from a coach if you leave a mess. I just bought a cheap yard of burlap. It tied in nicely with the somewhat rustic theme I was going for and I literally just scooped it up and put it in the trash right after. I’m SO glad we did this! If you can swing it (or if you know an awesome photographer like we do) have someone take a few pictures before the party. This is a great way to capture your memories of the party and your adorable birthday star! Try to sneak in a few family photos while you’re at it, if you can. The photo credit for our awesome memories here goes to Lily McGregor Photography. Love them! Football Birthday Party = Touchdown! Overall, I was SO happy with how the party turned out and that we went with a first birthday football theme. And the best part is you could probably adapt this to any sports theme first birthday if your little one loves soccer or baseball, etc. There you have it: your guide to a football party theme that’s simple and fun. Hopefully this gets your creativity stirring and you end up having a great time at your little one’s birthday party. Don’t stress! It’s just a party and doesn’t have to be Pinterest perfect. You can definitely see some of the flaws in our football party, but it was such a sweet celebration. 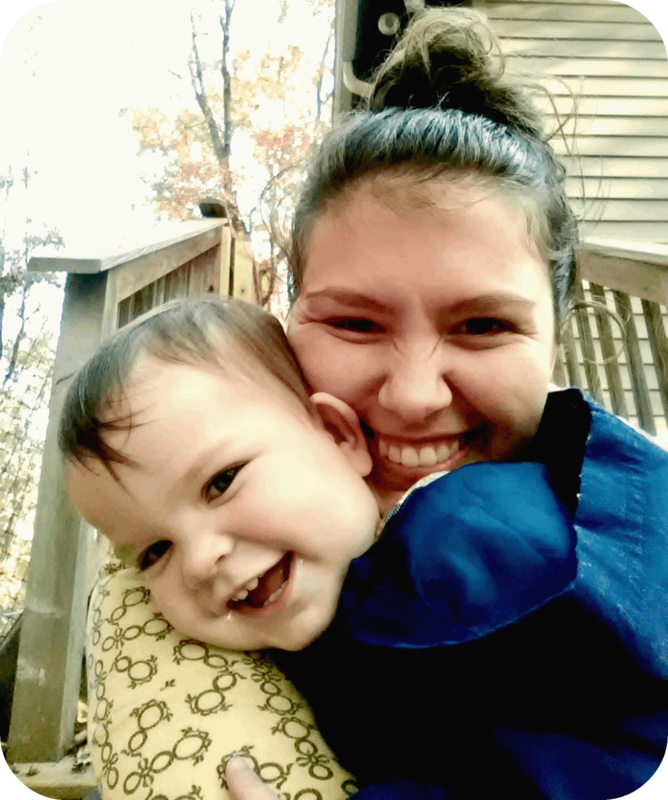 Just enjoy your kiddo and have FUN! 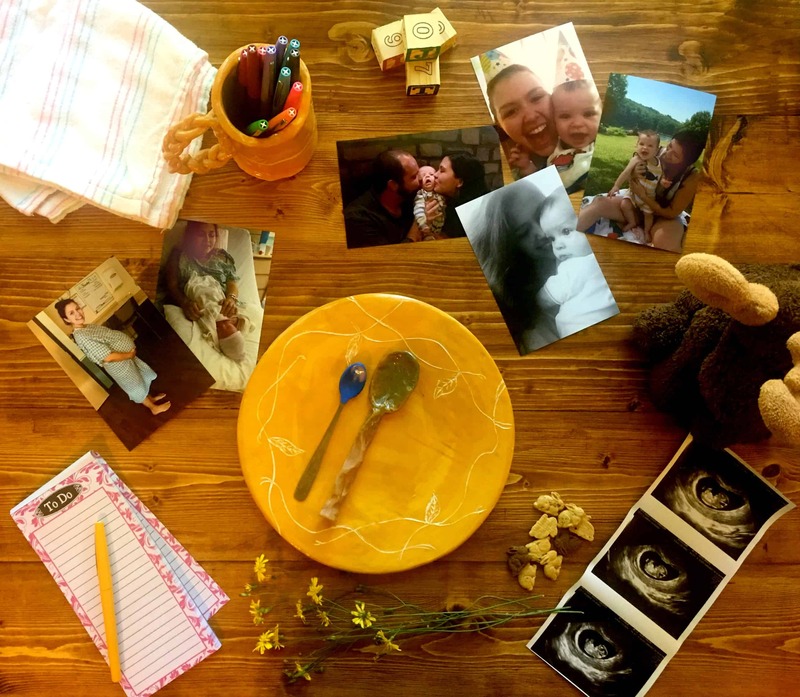 For more tips on pregnancy and life as a new mom, follow me on Pinterest!